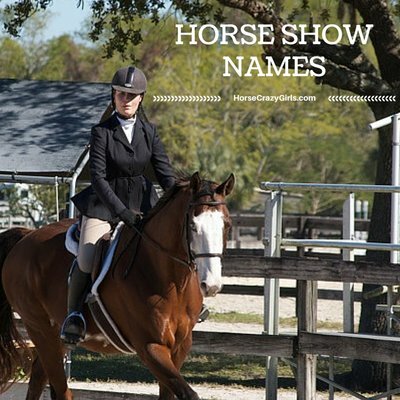 Share your favorite Horse Show Names! Here you'll find horse show names shared by other horsecrazygirls like you! Feel free to comment on any of these names or share your favorite horse show names. I think tattooed fire is a cool horse show name!! Well, it might be my favorite but I'm not too sure. I have many favorite names like Dazzling Silver, Thunder's pride, Thunder's Cherry, Thunder's dust and Thunder's Star. I'm buying a horse, and the horse doesn't have an official Show name and a barn name, so I decided to have his show name be Talk of the Town, because when I'm done with him and showing, everyone will know him, and he'll be the talk of the town! Get it? I'm a fan of jazz music so it was the perfect name, especially since my horse is very laid back and is colorful. I have a very fast horse and when I was trying to catch it as a foal, I said it moved like a streak of lightning but I thought it was too long so I shortened it. My 13.3hh gelding is a creamy palomino and the color of creamy Toffee and it suits him loads! At a show the judge even said what a lovely name that suits him! His show name is Toffee Surprise and I love it! Because my favorite girl is called Star. and it also makes a good show name .. (Star Dancer) Yes Star Dancer is my baby's show name here. I chose this name because I wanted a powerful long name like show horses names and for some reason Callaway came to mind. I could call her Callie! That's my eventing horse! He is so cute. Thoroughbred racing name he got from he's parents but he hated racing and loves to jump. LOVE YOU CHIEF! Sugar is my little Thoroughbred racing star! now she's perfect for show jumping! Because that is the name of my horse and I love him very much. He is a 8yr old 15.6 hh light bay gelding x-racer and show jumper. Well her barn name is truffles but chocolate truffles is her show name. She is a 7 year old quarter pony and she is 14.1 1/2 hands!!! I have a few, but the one name I absolutely love is Rookie's Gambling Chance -a show name for a quarter horse that I hope to own one day- barn name: Gambit. It's a bit of a play on the chess move called a gambit which can only be done with the rook piece. The pony is a great pony at shows - the pony would do everything right and the pony would be your hero! This is my eventer's show name. I named her this because when I got her I didn't like her at all! she was only a year old and she didn't know anything! she is now seven and I am proud to say that I have trained her all by myself and we are now competing successfully at the novice and pre training levels. Awesome for a horse with background! Getting a big grey gelding from Germany who’s sire is Colestus, please help! I think Especially Hanus is an awesome show name for a seriously awesome horse, maybe a black horse. I like this name "High Hopes" because if you're jumping, your horse sometimes jumps high and you "Hope" to jump high. Hey everyone! I need a show name for my 15hh bay gelding! Suggestions please! This is perfect for a sweet mare that has a few flaws because every Rose has a thorn! I hope this helps! This isn't exactly anything to do with horse names, but I'm advertising an unfailing prayer that worked for me, and requires publication after it worked, so here I am. This prayer is the DEAR HEART OF JESUS prayer, and you can look it up for more information. I joined a cross country team and LOVED it. When my siblings seemed to want to join, I prayed this prayer for them to get other activities and not invade mine. It's worked, and now it's my job to pass on the prayer. Thanks, and God bless. There's a horse at my stable called 'Moxie' and his show name was Man In Motion and I think that's really cool! Does anybody have any show names for a horse named Arrow???? She's a dappled gray Arabian mare. And she's SUPER sweet! Any suggestions? I have 2 new mini horses - a chestnut mare with one blue eye and one brown eye that I named peanut and I desperately need a show name for her. I also bought her sister who is a dapple grey mare her name is Abby. Please give me show name suggestions. I love these names because they make the horse sound beautiful (like horses are!) and I like gems and stuff. I love these names because...well, because! Dancing with Fire is a name that I really like and I plan on perhaps when I get a horse. And I don't really connect with it's show name or if it doesn't have one I'll name it Dancing with Fire or Dancing in Fire. Magic Spirit is a lovely name, so is Thunder, Lightning. If you would want a longer name, Thunder and lightning go well together as a name. My horse is a chestnut and his name is Jasper, show names please. He's going to be an eventer. Show name for my pony? I own a roan Connemara pony, she's an eventer. Her barn name is Neptune and I'm struggling to think of a show name. Any suggestions? I think the name Increasing Speed sounds cool for a show name or a racehorse. I think it would fit a solid color horse. I have a buckskin tobiano gelding named Cody. It may be slightly overused in some ways, but I just love the mystery behind this name, and it's of course perfect for any black or dark horse! I have a 14.2hh Flea Bitten Mare. She is 9 years old. She came with the show name Make a Wish but it didn't dazzle me so I decided to change it to Dancing on a Daisychanin. I got a mare that came with this show name and I just fell in love with it and she always keeps you on your toes and excited so it definitely fits her! I think this is a great show name for a horse called steel! I also like the show name "Cu again" because if your horse is called copper then it really fits in. Hi I have a blue roan mare she’s 15.3hh and sweet but protective and sometimes moody. She's called eklissi (but we call her elk) which is eclipse in Maltese. I’m stuck for a show name. I wanted something fancy because she is very fancy. I love shouting down the field lady Vicky! There's a horse named gypsy at my stable and she had no show name, so i called her Gypsy's blackberry pie, because she is a piebald, and the color of blackberries. I have tried making stuff up because I am a halter show gal. Please help choose names! My horse's barn name is Miss Kitty, I'm currently training her for hunter jumper shows, any ideas on show names? What’s a good show name for a horse named pumpkin that has nothing to do with spice or pie? Show name for horse named Luna? What is a good show name for a mare named Luna? She is a stockier paint and does Eventing. My chestnut quarter horse's show name is Dynamite Gal. She is bomb proof! Such an amazing horse! Because this is the name of my horse and he's gotten me through so much. I love him very much! What would a show name for a horse named thunder be? He’s a pinto and very talented, and pretty. Skewbald paint: Jumparoo, Splash of Color, Muddy Puddles, Jumping Bean, Pinto Beans, S'mores; Old West sounding names, place names, etc. I think the name Bandit sounds great for him. Bandit on the run is a cute show name too! Bandit on the run? Bandit? I am buying a thoroughbred bay colored gelding, and I was thinking of bandit for his name, and then bandit on the run for the show name but I am not sure. Do you think bandit would fit? I have a horse named Texas. I need a show name for him. He is really laid back but a little spooky on ground. He is a Leopard Appaloosa. Thanks in advance! What’s a good show name for a skewbald/paint? I have a skewbald that’s probably more white than brown. She’s mainly a show jumper and I need help finding her a show name! I need a show name for my mare, Moon. But I don't want a basic name. I want something unique. His barn name isn’t Rambo. And since in the movie, Rambo wears a red bandana, I thought of the show name Red Rambo or Red bandana. So there you have it, her registration name is Quinn of Hearts. I need to think of an amazing show name for my horse. Her name is Elora. She is a 16 hh bay and she is a jumper and has quite the personality. Can you help me find a show name for her? My pony taco needs a show name, he is a chestnut and is 13.3 HH. Anyone have any ideas? Okay, so I just purchased my first horse and his name is Albert and I need a show name for him and possibly a new barn name because I don't really like the name Albert. I want something fun and unique, he is my first horse. My friend has a horse called diesel and really neeeds a show name! 13-year old Quarab bay colour with white star and dark brown mane and tail. Very calm and I think does both western and English. I need a show name. My horse is very crazy, does bucks I get chucked of so I need a nice show name. I’m buying a horse and her name is Katie but I want to show on her and so her show name is going to be Kit Kat Katie. I need 2 show names for my horses fairy and scout. They were both abused when I got them so I would like something relating to that and their names. I also need one for pony called spice preferably with her name as well. Fairy and Spice are mares and Scout is a gelding. I need a name a for a fiery spanish mustang stallion. He's got a lot of attitude so I was thinking something like Flaming Hot or Rumble of Thunder but I haven't found a name that matches his personality. I'd like it to be two words thanks! I have a bay gelding tb and I was looking for a show name because I did not like the one he has now. Any ideas? Hi, does anybody have any ideas for a show name for my grey mare called GEM? What's a good show name for a horse named Shy? Hey, what’s a good show name for a horse called Griffon? BTW we call her Cadia because that's what she answers to. I enjoy these names very much... I used them for my Schleich XD! A good show name for a bay or grey pay or horse is 'Fifty Shades of Bay' or 'Fifty Shades of Grey'. I’m back with more horse show names!! Hope these helped out! Stay tune for more! Any show name suggestions for a stocky palomino pony called cowboy? Something short and sweet would be great. . I think 'Unicorn in Disguise' would be a good show name. Any ideas for a dark bay (mainly black) mare named Olive with a star on her forehead? I’ve read some comments, everyone seems to need show names. Here are some I think are pretty good. I had a horse named Beau and he was the most gorgeous horse ever! Big Beautiful Thoroughbred! He jumped so beautifully and can jump so big! He has the looks, personality and the jump. Beau Beau means beautiful handsome. I always told my friends about him, so I thought Bragging About Beau just fit! I like a little dry humor to show names, and I've come up with a few to fit my HUGE bay mare :). Pride Rock is my horses's show name. His barn name is Simba and he is my chestnut 15.3 gelding with a bold face! Hey, I need more of horse names. My two horses have very unique horse names. I don't like names like Ask Me or Call Me Please and stuff like that. Isaac is a traditional cob and will be starting showing soon in 2018. He is a very cheeky but handsome looking boy. I was thinking on a smart or posh show name. Any suggestions? I will definitely consider those names. I really like the "believe in bobby". I think Black Magic is an awesome name! Hey, I think your show name for your Shetland pony should be something like Secret Valentine or Heartbreaker. I chose this show name because it seems catchy and goes well with how fast our cob is. I am needing a show name for my daughter's Shetland pony. Her Registered name is Valentina, but we call her Valley. An adorable appaloosa had this name at a local show. Thought it was so clever! So I do pony club on my horse Bobby and he needs a show name to compete. I think you should give her the show name "sea shell in the sand" or "sea shell". I have a horse called dynaflight and I want to change its name. Tell me what would be a good name. It is a chestnut mare. So if you can reply to this (not sure if you can) but if you can, her name's mermaid, she's 15'1, white and brown and a 5-year old. I have a four year old ottb chestnut gelding... his barn name is yankee but I need a show name for him. Not sure what his track name was. Any ideas? I just got an 8yr old OTTB gelding. He's bay and very sweet and calm. His race name is Bold Ice. Any name ideas for a barn name? I'M DESPERATE!!!!!! We have tons of names on this site - I hope you find one you love. And CONGRATS!! So exciting. If you're looking for a petite and exotic type of name that's French I reckon: Très Parfait would be a nice choice because it means very perfect. For my Bobby Boy, I forgot to add he is a palomino. So I have this horse and his barn name is Bobby, I do pony club on him and need a show name for him. Anyone have a name for this darling of a horse?? I do dressage, XC, and showjumping on him. Barn name for without trying, and where's the jumps? Do y'all have any ideas for my horse named Turtle? She is not slow but sometimes she lives up to her name. If something is new in the pasture, she likes to prance and crow hop (bounce) and she loves to jump. I am a hunter jumper doing SHJA shows so if you have anything in mind that would be so helpful. Hi guys! I have a horse named Ziggy and I need a show name. She is a 9 year old QH, has a snip and one sock, she is also really sweet and a good hunter pony. I love this show name! I honestly LOVE the name Blue Legend. Does it suit your horse? That's my suggestion. I'm trying to come up with a show name for my horse Fancy. She is a dark bay paint and I was thinking maybe something french or having to do with fantasia or fantasy or being high class or something I honestly don't know, any suggestions? My mare's name is Chilly and I don't like her registered name so her show name is Based on da Attitude. I need a show name for my gelding. His barn name is Icon and I would like that to be included in his name. Be My Guest - This is my horse's show name. He is a palomino, 6-year old, 17'3 hh horse and I just love this name his original owners used for him. I have a new gray barrel racing gending that I need a cool show name for. He came with the name "Blue", so something with Blue in it would be good. What do you have? I think that Tommy Hilfiger would be a super cute show name! Here are some names for the people who asked to be given some. 20-year old Arab named Zeus does not have a show name. He is very fast and springy. I never saw the horse itself, but I heard his/her name over the loudspeaker once, and it has just stuck as one of my fave names. It just has this touch of sweetness and innocence to it which I love. This is my pony's show name, we chose it because her name is Jazz and she has a big white star on her tummy. Hi, my horse is a 3yo, 15.3hh unraced TB x Arab (maybe not sure about the Arab part). He is a liver chestnut colour with two white socks and face markings that look like Italy. We are doing dressage at the moment but will hopefully go on two eventing. Please help me find a show name for him. I was thinking golden nugget but I'm not sure. My horse model barn and show names!!! Those are my some of my horse model names! I hope they give some people some ideas for horse names. Note: I don't have show names just yet for Justice and Bandana, I'm finding it quite hard to find show names for the two. So if you have any suggestions please bring them on. Sometimes I just like two names and find a way how to make them fit together. I own a Dapple Grey Arabian that needs a show name, any ideas? I need a show name for my horse Sadie Jane. I have thought of a few like Sadie Jane's got game, but I still need some more ideas!! Please help! That's all and it's a lot of names!!! Need a show name for my 5 yo thoroughbred! Her name's beauty but I'd rather not have beauty in the name. Black, chill as ever. Horse show name ideas please! 14.3hh bay Hanoverian cross is called Pluto. He doesn't compete anymore but by gums with this name he got well known locally which is rare around these parts but he competed amazingly. Go for this name. I think that Maple Mocha is a great name for a brown or bay Morgan mare. That's the name of my adorable Appaloosa dressage horse. I absolutely love him. Here are some of my fave show names! Romeo. I have to come up with a show name! Any suggestions? Need a show name for a black and white pinto mare! I got a horse this fall and am showing my first time this summer. I have to come up with a show name but am having trouble thinking of a good one. Her name is Angel and she is a 16yo Haflinger Quarter horse cross. Any ideas? Need Showname for possible new horse! My possible new horse's name is Wilow, and I am having trouble thinking up a show name for her. She is a 14yr old AQHA cross, standing at 15hh. Any suggestions? I had a hunter called D'artanagan and a thoroghbred named Red Venner and I currently own a jumper called Boy blue. Horse Crazy, I think a great name would be Roman Emperor or something like that because Titus was a roman emperor. And Alexa, I recommend Precious metal or Titanium. Need a show name for a horse named Taxi? My idea is "Here's your ride". I love horses but don't own one! I read a lot of stories on Wattpad and this one name inspired me, and at the stable I ride at, a horse's name is Wind. I have two stories on Wattpad, one is called "The Four M's" and the other one is called "Love, Horses, and More?" So I'm doing a show on Apr 29 and I'm riding a horse in his first show... and he needs a show name. His name is Titus. He is an OTTB (Off the Track Thoroughbred) and stands between 16 and 17hh. He's a gorgeous bay with an off-centered yet perfectly diamond-shaped star on his forehead. He will be used in hunter/jumper shows. Thanks in advance! Two of my horses are called Holley and MJ. I love Holleywood for her show name cause its flashy and famous. And MJ is bred from Jesse James lines and My name is Emily. So he is my Jesse. I love it. And its the nickname of Michael Jackson the King of Pop (R.I.P.). I often spend time dreaming about owning my own horse and competing but I am afraid to say I never will, anyways I still day dream. Anyways here is a name that is stuck in my head: Son of the stars and his stable name would be Comet. My pony is named Thunder and he didn't have a show name because he was a western barrel pony but now I'm training him to do saddle seat and he's a natural at it and he has his little fancy trot and everything but I decided his show name be either Thunder's Pride or Thunder's Fiery. Which one?? My horse's show name is Akela's Quest. It is very unusual but she suits it, I think. I need a registered name for my horse Dakota, she is a bay QH. I like the show names April Showers and Golden Fantasy. My Hanoverian gelding's name is Elliot, and as a joke we made his show name Elliot Ness until I could think of a better one. We ended up keeping it! Elliot Ness was the man that put Al Capone in prison. Moonshadow - Like the song leaping and hopping on a moonshadow. NEED OF A SHOW NAME!! Hey everyone! I am in desperate need for a show name for my horse Titan. He is an off the track thoroughbred gelding and we are going to our first horse show together. He's only six and he's very green but I'm so excited! I really need a show name and I was thinking something on the lines of sailing back to you? what do y'all think? Do you have any suggestions for me? Do you think that's cute? Let me know if you have any ideas!! I would love to hear them! You may have seen all these, but I hope you like 'em! Need A Show Name For a Mare! I'm getting a black mare and she needs a show name! She has a crescent moon shape on her head and her barn name is Pipa! Any show name suggestions? Any ideas for a small pony called Charlotte, who is a cloudy grey pony with a slight dishing face who is so sweet and loves to jump but is very laid back? Personally, I like Shoot the Breeze cause it's an idiom and it seems nice and almost casual. I love this name! The horse that has this name is called Toby in the barn. Hi! I need a show name. My horse is a gelding. Black, loves to jump. He's the kindest horse EVER. Beautiful and his name is Bailey. Please help! How about flash some cash? The horse I am getting doesn't have an official show name but I have been thinking about names and my absolute favorite is All That Jazz. It is such a cute name with a little sass. I really like this show name! Hey Anna, I think that you could dip your horse's color in front of Rascal like Bay Rascal or put your town/city/province after it like Rascal of London. Does anyone have a show name for a horse called Dusk? Please tell me. He is a tall skinny pony and loves jumping. I saw there was a comment asking for show names a while back (June 2016) for their horses named Tom and Lucy and I was thinking of good show names. I think a cute show name could be Jigsaw Puzzle. This is for the girl with Jig. Mothy because it is cute! A few names, I like! I also am getting a horse soon. She is a sorrel with a zigzag strip down her face and two stockings. She needs a show name and her barn name is Jig. We may need to change that. Adelaide - Possibly for a grey or palomino, maybe a chocolate brown. Adelaide surf is the name of my eventer. I like Kick the Dust Up. It's a Luke Bryan Song and what horses do! I was going to make this my horse's show name but I came up with a different one. But I still love this one! She has two white socks on her back feet and her name is Havanna aka Havi. Hi! I have a thoroughbred mare at home and she is getting measured tomorrow and I need a show name. BTW her name is Holly. I think a great show name for your mare could be "Eclipse" or "Dancing at Midnight" or "Once Upon A Time". I love both names! Those are all the names I could think of! Looking for a show name for a 17.0HH warmblood mare named Havanna. She is a super dark brown (looking like she's black). She has three little dots on her withers and has a stripe down her face. She also has two white socks on her hind feet. Need a show name! I need a show name for a bay filly thoroughbred cross, very glamorous. Like something long and powerful even though her name is tulip. At the barn I work at there are two mini black and white horses. Their names are Strongest and Country Rider. My friend and her sister show them in carts and in showmanship. My job is to feed water and groom Country Rider. One day, Bella (my friend), asked me to lunge Country Rider. I went over to his stall but he wasn't there. I almost called the police until Bella told me that was Strongest's stall and he had a show. We have 2 horses named Tom and Lucy. Tom is black and a Welsh. Lucy is a grey Connemara and we would love it if anyone could think of the greatest show names for them. Thank you! Would like to ask you what show name would be best for her? I have a horse named Owen but he doesn't have a show name and I'd like to have one for him. pretty much any horse good!! My ponies are called Crunchie Nut Surprise and Dizzy Rascal. 10 amazing horse show names! Hi! I need a show name and my horse's name is Blossom. She is a pretty palomino. My horse's name is Diesel and I need a show name! He is a paint and a little stubborn. If y'all could, can you help me? Thank you so much! Hi, I have a horse named Brodie and I am trying to find a good show name for him. We are going to do the show in May and I need to find one very, very soon. If anyone has a good idea it would be very appreciated. "Ima classy star" is a good name. It's the show name of a horse I ride, Peppy. I have a tall warmblood paint named Archer. Looking for a good show name to go with it. Thank you. This is my horse's show name because he was a rescue horse because his owners abandoned him and we got him, and his life is a lot better now. So his show name is Lucky Lad. I love Give It A Chance for a chestnut gelding with blue eyes and a blaze, but that's just me. That name can be for any horse really. Another one that I like for a dapple mare is Interstellar Dream. My pony's show name is Annings First Step, but you might not want to use that one because that one is based on the name of the barn where she was born. Another cool one though is Under The Stars. I like Lil' Miss Diva. The barn name would be Girlie. My TB gelding show name is Gentle Giant and his barn name is Wellington. He is a liver chestnut. My QH gelding show name is Twisting Spark and barn name is Sunny. He is a palomino. And my pony's show name is Sweet Dreams and her barn name is Oreo. She is black and white pinto. I love the horse show name Hot shot, it is one of my favorite horse show name. Hope you like it! I don't know, I just really like this name though my real horse's name is Jade. I own a little dappled grey mare called Pepsi. She thought me to jump and do cross country. Two at a time I think is a cute show name as riding is a sport of two minds. My horse's name is Smartie and he is a bay! He is quite old but his name is Smartie Pants. 😆 I also have a horse that is a chestnut named Chance and his show name is A Big Chance. I have one more that is not a horse but is an idea of mine particularly a black and white horse that show name is Four Leaf Clover or as his original name Clover. I like this name a lot! Sterling Silver. I used to have a gray pony and she wasn't named this but I always thought it was cool. When I was in the jumpers with my pony Stormy, who is very slow all I thought was goes the clock. I have many more I hope to share. Robin... maybe Baby Girl, Baby Cakes, Lil Bit, or Littlegirlofmine. I know the last two don't have Baby in them but I couldn't think of more good ones. My favorite is Littlegirlofmine. I know a super sweet, young retired racehorse filly with that name and her barn name is Baybie. :) Let me know what you think! Just happened to see this... maybe Edward, Edmund, Blackberry, Midnight_____ (fill in the blank) or Rocky Road? I've always wanted to name a horse this. I love the name Apollo and Dreamer so I just made them one! Can anyone think of a show name for my black traditional cob Eddie? His name does not have to be included in it. I have a 5 year old draft cross mare named Baby. I need a show name for her this year. I want something unique but easy to pronounce. I also want her name "Baby" in it as well. Any suggestions? This is a great show name for a horse. I named my 6 year old chesnut gelding this and his barn name was Oh No. I think a great name is Geronimo. Does anyone know a show name for a horse called Macca? Thanks for reading my horse show names! I have some stuff coming out soon. One is you know your horse crazy when.. the other is how to create the ultimate horse themed room. For a golden colored gelding, Sand Man is a great showname for a gentle giant. I think this is a cool name for a grey gelding. I love the name flash. Ok, yeah I know things are just turning into regular names but I like them. The last two are Indian names and it means falcon (I mostly just like how the name sounds) and big eyes. I used to know a super cute Palomino named Star. I do not know what happened to her. It has been a while since I saw her. This is my Registered American Saddlebred gelding's name. He is trained in Saddle Seat Equitation. He is 17 HH and Guy is his nickname. I don't know his registered name yet because the guy I'm ridding him for hasn't gave me the papers yet and he can't remember his registered name. I really like this name because it's simple but still classy. My faves are probably # 19, 20, 4, 5, 9, 10, and 13. I like this name because it means the highest king or queen of Mecca. I did not name my horse this, we got her named that although I love it. My horse is called Ghostling. It is her show name. I love her so much!!! Because Little Bit was my first horse I had and he was in shows. Because it is a sophisticated name, but not too so. She could be a wild mustang or a show horse! i liked the names of those horses. Because my horse is called Star and this is her show name. I also think it's really pretty and because I trust her with everything I do, she's a wish come true. Tasmania is a cool name and Tazzy for short cause otherwise you have to say Tasmania all the time. Redwind's Promise Girl, Yarrow Fire, Black Sable Fire, Shasta Moon.. All of these are show names! These are some of my favorite show names: Mary Poppins, Sugar Rush, Adrift, Clockwork, Topsy Turvy. Cool barn names: Sonic, Bling, Sunny, Xena, Mellie. Love it! I have seen someone's horse at a show with this name and I think it is a really nice name. I choose this name because I have chestnut and he is an angel. I really like those names especially derby, velvet, cowboy, Tennessee devil and mistress spark but my FAVE is southern Spark probably cause I'm a southern gal! I like the show name "colour me derby" for a horse, especially a paint horse! Return to Fave Horse Names.